What To Do About – Or With – Russia? Each of the options has its own problems. 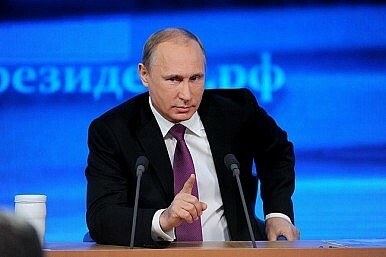 It is disturbing that Russia’s behavior under Vladimir Putin looks like a sophisticated blend of Nazism and Stalinism. Even more worrisome is that most Russians seem to approve of Putin’s brand of nationalistic imperialism. How to bring the world’s largest rogue state back to its senses and to some form of partnership with other leading nations? Should the West try to ignore or placate the Putin regime, or defang it, or work for its downfall? This essay analyzes the major alternatives and concludes there are no easy answers. Every approach generates its own nemesis. Developing wise policies toward Russia is all the more difficult because alternative futures are murky. In particular, six common errors plague efforts to anticipate Russia’s future. Of course, prognostication in any domain is difficult if not impossible because emerging developments both foreseen and unforeseen can spin off new and unimagined possibilities. While these “adjacent possibles” could bring brighter prospects, Russia’s horizon is darkened by the long pattern of exploitation of the country’s human and material resources by its rulers for their private gain – a common reason why nations fail. One policy option would be to try and ignore Russia and hope that its bullying and land grabbing will halt after it absorbs some Russian-speaking enclaves along its borders. But wishful thinking of this kind betrayed Britain and France in 1938 when they let Hitler annex Austria and part of Czechoslovakia. Putin’s lust to recover lost empire has no obvious limits. It surely includes the Baltic region and parts of Central Asia. Russia’s size, kinetic power, and Putin’s tactics create an urgent menace to Russia’s “near abroad” and beyond. Given the spillover effects of Russian expansion, the White House is surely wrong to call Russia a mere “regional” power. “Strategic patience,” as the Obama administration has attempted with North Korea, cannot suffice when facing a resurgent Russia. Option two: Containment by force of arms yields its own problems. Expanding NATO into the former Soviet sphere has been counterproductive. It weakened Westernizers in Moscow and helped bring revanchists to power. Having helped to spawn Putinism, most NATO member-states have permitted their hard power to weaken so that the alliance is less able to cope with Russia than in the previous decade. America’s European allies have let down their guard even as U.S. forces are stretched from Iraq to the South China Sea. No one dares to threaten what is still a nuclear superpower, but the West’s tools for non-nuclear action are thin on the ground. Option three: Economic sanctions have pained Iran, but they seldom stop willful regimes from abusing their own citizens or threatening other states. Still, sanctions aggravate the problems facing Russia due to falling oil prices and diplomatic isolation. Whatever the inconvenience that sanctions bring to Putin’s cronies and the Russian public, Russian military actions and threats have intensified and expanded from Ukraine to the Gulf of Mexico. Besides hurting some Western business ties with Russia, sanctions could truly boomerang if they helped to throw Russia into a free-fall. Option four: International condemnation and diplomatic isolation seem not to alter Putin’s ways. Rounded on by other leaders at the G-20 conference in Australia, he simply departed early, saying he needed sleep. Even if most UN Security Council members wanted to censure the Kremlin’s behavior, Russia’s delegate (probably joined by China) could simply veto the resolution. Having replaced a Kremlin stooge in Kiev, Ukraine’s new leaders in 2014 responded to Russia’s expansionist challenges in many ways. None of them proved very effective – neither passivity nor military action against pro-Russian rebels nor two negotiated ceasefires Whatever Kiev did, Putin continued to escalate his efforts to weaken Ukraine and foment separatism. All three of Ukraine’s major political parties now want the country to join NATO. Just talking about this goal, however, probably deepens Russian determination to destabilize Ukraine. Option five: What about another go at engagement? Both sides depend on each other – from arms control to outer space. Still, each bites its nose to spite its face. Both the Kremlin and White House worry about a nuclear-armed North Korea and Iran and how their nuclear programs could promote arms races in East Asia and West Asia. Moscow plans to curtail cooperation with the United States to safeguard Russia’s nuclear materials. Both Moscow and Washington are reducing their scientific exchanges. Putin says he will not attend Barack Obama’s nuclear summit in 2016. The growing distance between Russia and the West is manifest even in changes to the Russian lexicon. According to pyscho-linguist Aleksei Mikheev, the Russian language in 2014 expanded its lexicon of anger and hatred. Its chief characteristic was the manipulation to one or another degree of mass consciousness by the use of aggressive formulations. In 2013, Russians adopted and Russified many English words such social media’s “to like,” and “to friend.” But in 2014, Russians adopted only two Anglo-Saxon words – “selfie” and “fake.” They invented many new words with hostile connotations such as “krimnash” (“Crimea [is] Ours”) and “psaknut’” (a reference to U.S. State Department spokesperson Jane Psaki) construed as “to say something stupid but not admit it.” Russians also began to use euphemisms such as “humanitarian convoy” and “polite people” to describe their actions in Ukraine, ignoring critics who viewed these usages as hypocritical. Thus, words became part of the Kremlin’s arsenal. Orwellian doublespeak fostered doublethink – foisted on and embraced by many Russians. If Putin insists on rebuilding the former Russian empire, engagement seems like a lost cause. Still, making the Iron Curtain less porous proved both feasible and useful during the Cold War. Even as Nikita Khrushchev threatened Berlin and sent missiles into Cuba, cultural exchanges between the USSR and Western countries multiplied and expanded. The exchanges nurtured seeds of liberalism and eventually contributed to Mikhail Gorbachev’s “New Thinking.” One of Gorbachev’s closest advisers, Alexander Yakovlev, studied Franklin D. Roosevelt’s New Deal reforms at Columbia University in 1958-59. He hoped that reforms would also save the Soviet system, only later to doubt that it was worth saving. But it takes two to tango. While Khrushchev wanted exchange, Putin does not. Should the West seek another reset with Moscow or strive to repulse and face down an imperialist dictator? Doubts and dilemmas overshadow any answers. Given this situation, what can we know about the parameters of Russia’s future? Would-be prognosticators count on six keys to Russia’s future. Most are too simplistic. Both science and human history, however, provide two lessons that show us both the possibilities and limits of future alternatives. One lesson is that prediction is impossible, because innovations in many spheres open the way to undreamed possibilities. The second lesson, drawn from all times and places, reminds us why nations fail. How can outsiders formulate wise policies to Russia unless their vision of future alternatives are rooted in reality? One mistake in policy planning is to take the words of a respected authority as valid for all time. What Winston Churchill and George F. Kennan said about Cold War Russia may no longer apply. A second error is to generalize about Russia’s prospects from a few cases or conversations with insiders or the man or woman in the street. What a taxi driver tells you on the ride from the Moscow airport to your hotel is only his opinion or what he wants you to hear. A third fallacy exaggerates the influence of individual leaders. To be sure, personal motives and qualities are important, but individuals usually rise to power thanks in large part to circumstances. Yes, Vladimir Putin has promoted a nationalistic imperialism quite unlike any policies pursued by Mikhail Gorbachev or Boris Yeltsin. Whether Putin goes or stays, however, Russia will probably experience more continuity than change. Putin himself responds to pressures and opportunities. If he departs, his successors will do the same. A fourth error is to expect that geography determines everything. Yes, Russia is rich in oil and other natural resources. How this bounty shapes Russia’s fortunes, however, depends heavily on how it is used and by externals such as supply and demand. Global warming may help Russia in some ways but hurt it in others. If geography is decisive, why is South Korea not North Korea? A fifth mistake is to exaggerate external influences. Many Russians scapegoat America and its conspiracy to weaken Russia, but U.S. presidents from Ronald Reagan to George W. Bush and Barack Obama did their best to help Russia regain its footing and join the international community. The country’s malaise stems from bad choices at all levels – beginning in the Kremlin. Apart from these common errors, the fact is that reliable prediction is impossible in many domains due to new developments and innovations that create what Stuart A. Kauffman calls “adjacent possibles.” Thus, the impacts of technology on society are unforeseeable. No one in the 1930s or 1940s could have envisioned how computers would change society. No one foresaw or intended that a mainframe computer could evolve into a personal computer used for word processing, file sharing, and accessing the World Wide Web. These unfolding developments generated new sets of adjacent possibles whose impacts have included Google, Facebook, the Arab Spring, and Edward Snowden. The enabling possibilities that lie ahead for Russia and all humanity outstrip our imagination as well as our knowledge. The good news for Russia is that no one can anticipate the adjacent possibles into which human systems may “become.” No one can know what humans will enable by their laws, policies, and innovations. The bad news is that nations stagger and eventually fail when rulers exploit the country’s human and material resources for their private gain. For more than a thousand years most of Russia’s bosses have been predatory exploiters who used the state to enhance their private interests rather than create value for the common good. For centuries most Russians had no way to evaluate their rulers’ behaviors. Now they can do so but many are blinded by the Kremlin’s media control, by wishful thinking, and by habitual bowing to authority. All this tends to limit Russia’s prospects. Even in the age of computers and global interdependence, Russia – like China – continues to experience the dead weight of top down controls on science and technology. The continuous emergence of adjacent possibles enables, but does not cause, innovations in our personal, artistic, scientific, economic, cultural and political lives. Policymakers should strive to tap both evolving synergies and serendipitous opportunities. For Russia, the lesson is to permit more freedom and avoid punishing out-of-the-box experimentation. Greedy leaders exist in most countries, but Russians have few levers to shift the way their country is governed. Unless the Russian public demands and gets greater freedom, the country will suffer from more of the same. Will Sanctions Stymie Russia’s Resurgence in Central Asia? Moscow’s projects in the region are coming unglued just as the West steps up sanctions over the Ukraine crisis.